Throughout the ages there have been countless interpretations of E.T.A. Hoffmann’s 1816 short story The Nutcracker and the Mouse King. From the famed 1892 ballet production, scored by Russian composer Pyotr Ilyich Tchaikovsky and choreographed by Marius Petipa and Lev Ivanov, to several animated versions, including 1990’s The Nutcracker Prince, and a direct-to-DVD Barbie movie in 2001. And who can forget that God-awful The Nutcracker in 3D (2009), which is currently sitting at a dismal 0% on film review aggregator site Rotten Tomatoes. Seeing as The Nutcracker and the Mouse King is public domain, it was only a matter of time until The Mouse House got its mitts on the property, subsequently developing its own big-screen version, this loose retelling released just in time for the Christmas season. Unsurprisingly, though, the end result winds up feeling like a second-rate hodgepodge of other first-rate fantasy classics, such as 2005’s The Chronicles of Narnia: The Lion, the Witch and the Wardrobe and Tim Burton’s Alice in Wonderland (2010), Disney’s latest adaptation a strange collision of dance, costume and VFX, one that’s best comparable to something like 1990’s The NeverEnding Story II — you know, a film that’s not as grand nor as polished as others of its type yet still offers enough oddball weirdness to leave an impression. Penned by newcomer Ashleigh Powell and Tom McCarthy, Christopher Robin (2018), our story begins in a Victorian-era London on Christmas Eve, where we meet smart teenaged tinkerer Clara Stahlbaum (Mackenzie Foy), who’s in the attic, fiddling with her latest Rube Goldberg-type contraption. We quickly find out that Clara’s mother Marie (Anna Madeley) has recently passed away, leaving her grief-stricken husband (Matthew Macfadyen) and her children, Clara, Fritz (Tom Sweet) and Louise (Ellie Bamber), behind. Given that it’s their first Christmas without their mom, Marie has gifted her kids with one last present; for Clara it’s a locked porcelain egg with a note that reads, ‘Everything you need is inside.’ While attending a fancy Christmas Eve ball, hosted by their eccentric inventor godfather Drosselmeyer (an eye-patch wearing Morgan Freeman), Clara wanders off to find the man in question, who’s hiding away in his elaborate workshop, to ask him whether he knows how to unlock the egg. 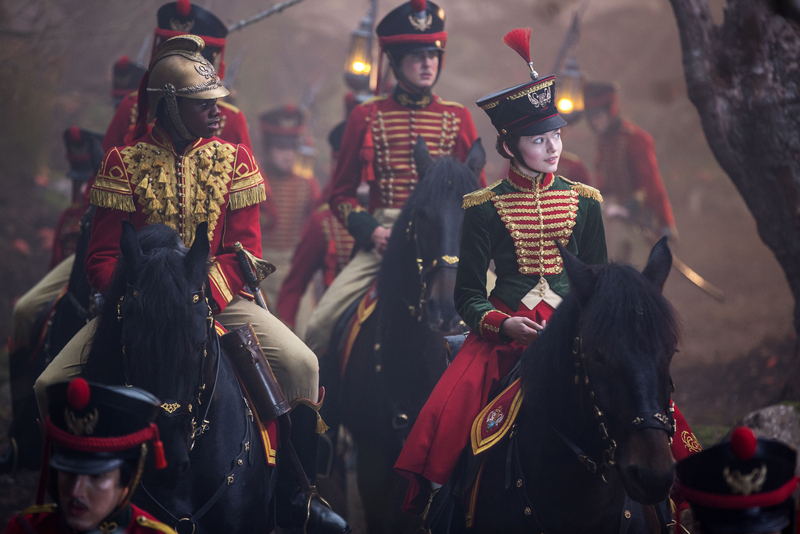 This leads Clara into the mystical world of the Four Realms where she meets a life-sized Nutcracker soldier named Captain Phillip Hoffman (Jayden Fowora-Knight), who, despite being the titular character by name, is very much a second tier player, the aforementioned guiding Clara through the Wonderland-type domain, along with his trusty horse Jingles. 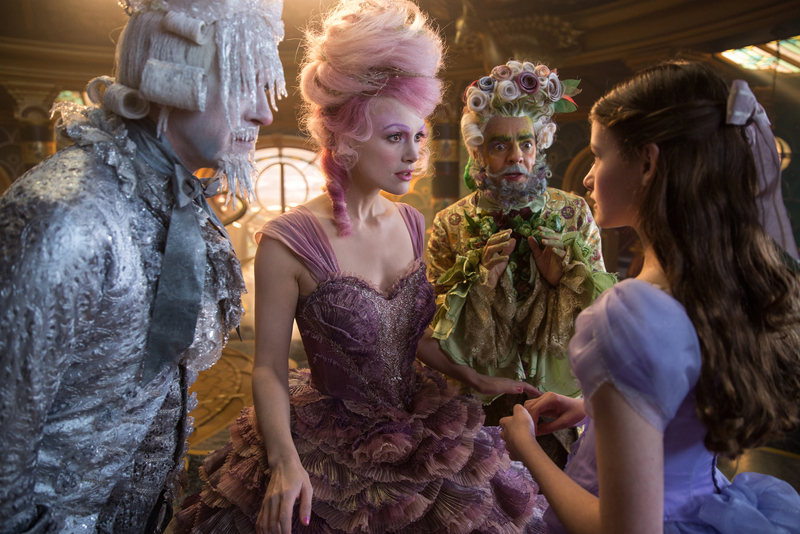 It turns out that Clara’s mother used to rule over the kingdom alongside four other monarchs, one from each realm: the saccharine Sugar Plum Fairy (Keira Knightley), regent of the Land of Sweets, walking bouquet Hawthorne (Eugenio Derbez), regent of the Land of Flowers, the ice-bearded Shiver (Richard E. Grant), regent of the Land of Snowflakes, and the enigmatic Mother Ginger (Helen Mirren), who’s domain, the Land of Amusements (or nightmare-inducing circus folk), has fallen into ruins, and is now simply referred to as the Fourth Realm. With Clara quickly becoming the new princess, she takes it upon herself to save the people from the ghastly Mother Ginger and The Mouse King, a monstrous presence lurking in the Fourth Realm, her quest leading her to retrieve a key that’ll simultaneously unlock her egg and save the realms, this trinket able to power a special machine that can bring toys to life, thus giving the monarchy an army to fight against the mounting threat. Although two very different filmmakers share a duel-directing credit — Lasse Hallström, Chocolat (2000), did the principal photography while Joe Johnston, Jumanji (1995), was called in for four weeks of reshoots when Hallström wasn’t available — The Nutcracker and the Four Realms isn’t as fractured as one might think. The story itself is pretty straightforward and follows the classic template of the Disney princess journey, the narrative trailing a young girl who’s struggling with the loss of her mother, her trip through grief leading her to a magical world where she must pull herself together and find her inner strength in order to save the land and solve the mystery that her mother has left for her. Unlike the original Nutcracker ballet, where it’s unclear whether the world of the Nutcracker actually exists, Disney has opted to ditch the play’s ambiguous nature for a more fantastical update. This, however, is where the film falters, its sense of discovery and world-building coming off as somewhat half-baked; the geography of the kingdom is wishy-washy at best (most of the movie takes place in a large castle at the center of the land), while it’s a little hazy as to why the realms are even fighting. Not much is known about Clara’s mother’s days as Queen of the realms either — Did she have special powers? How long was she there for? 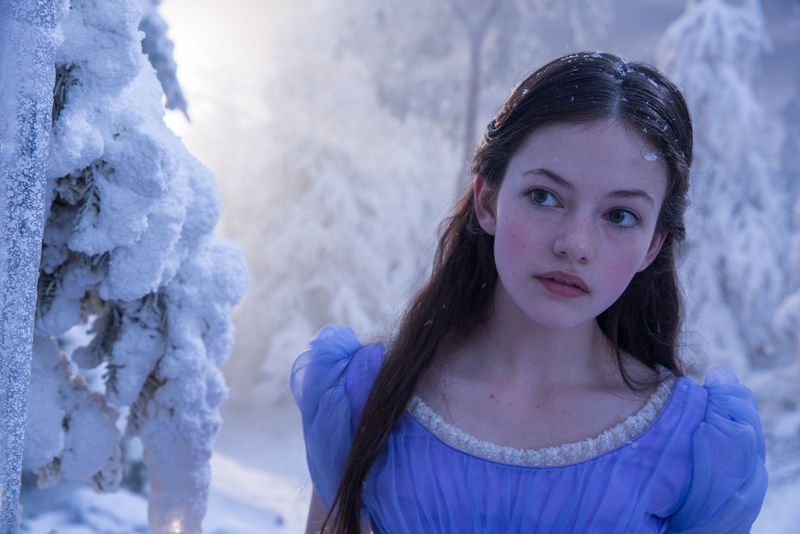 Why didn’t she tell anyone about her time in the fairyland? This isn’t to say that this latest Nutcracker is devoid of any pleasures, quite the opposite, as there’s plenty to enjoy in terms of pageantry. We have an excellent Fantasia-like dance sequence (complete with practical sets) that features American Ballet Theatre’s Misty Copeland, which loosely explains the history of the realms, and a number of kooky critters, chiefly a rascally rodent known as Mouserinks, and The Mouse King (a squirming body of mice working together as one moving mass), with hip-hop dancer Lil Buck, who specializes in a style of street dance called jookin, inspiring the creature’s movements. The production design by Guy Hendrix Dyas, Passengers (2016), is first-rate, too, mainly Mother Ginger’s carnival-esque camp and moving candy-striped tent, whilst the elaborate costumes by Tony-nominated designer Jenny Beavan, Mad Max: Fury Road (2015), are utterly scrumptious, these adding to the confectionary of detail on display. Even the score by James Newton Howard, King Kong (2005), is a treat, the 67-year-old composer updating Tchaikovsky’s beloved music for a new generation to gobble up. Performances are also adequate, despite the film’s smorgasbord of thinly written roles. Mackenzie Foy, Interstellar (2014), is pretty good as heroine Clara, the young star managing to elevate the character’s underwritten emotional arc, whilst Helen Mirren, RED (2010), does okay as the feared Mother Ginger, her fiery red hair and cracked ceramic-looking face adding to her eeriness. Keira Knightley, Pirates of the Caribbean: The Curse of the Black Pearl (2003), is fun (and probably the best part of the movie) as the scenery-chewing, scene-stealing Sugar Plum Fairy, a cotton-candy-haired pixie who sounds like a warped version of Kristin Chenoweth and walks around like porcelain royalty, while Morgan Freeman, Bruce Almighty (2003), phones it in as the steampunk-y builder Drosselmeyer. And oh, look out comedians Omid Djalili, The Mummy (1999), and Jack Whitehall, Mother’s Day (2016), who light up the screen as a couple of pompous palace guards Cavalier and Harlequin, respectively. It also must be noted that Disney’s idea to cast black folk in key roles does very little for progressive representation here, seeing as said parts are barely substantial, and do nothing to elevate the overall proceedings. Sometimes you just need to reflect. 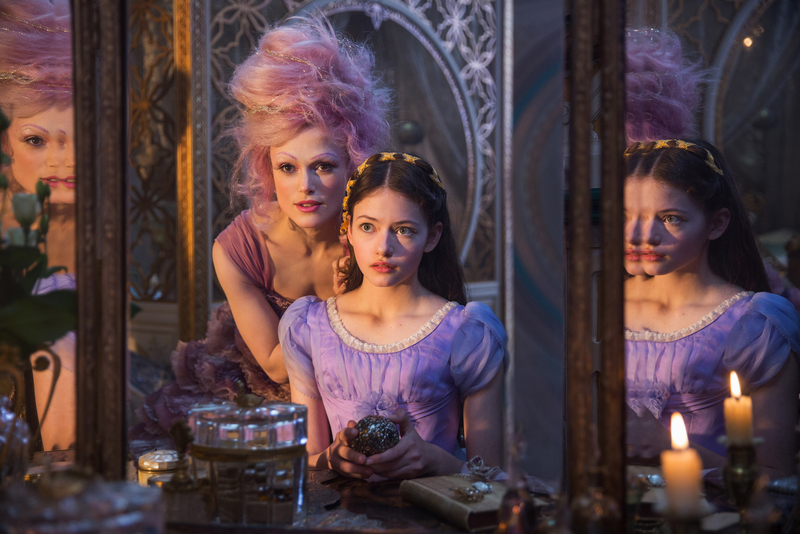 At the end of the day, the Mouse King’s, um, I mean Disney’s The Nutcracker and the Four Realms isn’t going to win Oscars or prestigious awards. It does, however, still remain wondrous to look at and easy to digest, with filmmakers managing to squeeze enough delicious delights and freakish holiday season magic into its flaky 99-minute runtime. Who knows, just like 1985’s Return to Oz or 1990’s The Witches, we might have another cult kids classic on our hands.